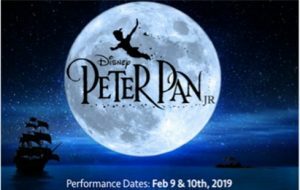 2019 Musical: Peter Pan Jr.
Online ticket sales are closed! Tickets are available for purchase at the door on the night of the show. Tickets for the Saturday show are limited, so arrive early if you’d like to attend! CASH ONLY PLEASE! Ticket sales are FINAL! NO refunds or exchanges accepted! The school and students are excited to present Peter Pan Jr this year. J.M. Barrie first told the story of Wendy, Peter and Neverland as early as 1902 when Europe was fascinated with the romanticism of the “American Wild West”, and while Barrie never even visited America, stereotyped Native American characters were common in the literature of the time. This representation in the play clearly conflicts with Countryside’s core values of Kindness and Respect. To address this, our production will present a thoughtful reimagining of this aspect of the play that is more in line with modern sensibilities, yet still offers a wild and exciting Neverland. We will address these changes with the cast early in the creative process during rehearsal, and invite parents to discuss this issue at home so that open and honest conversations can be had around kindness, respect and inclusion. Click here to contact the production crew.